The Innerverse of Jônatas - An Art Series on Immigration and Exile is based on the premise that different universes must clash with each other in order to create exciting new realities for us to discover, constantly and relentlessly, just like our ancestors once did. 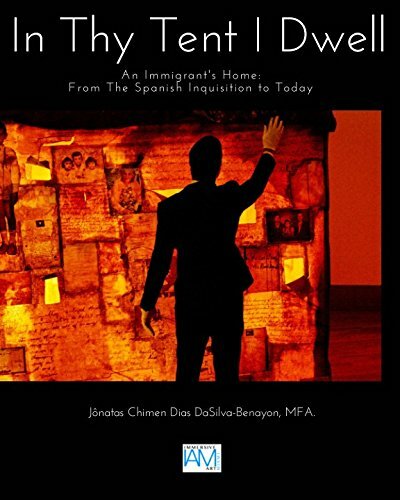 Spoken from a first-person perspective, this symbolist visual narrative makes use of folklore, history, and myth from the artist's 500-year heritage of immigration and exile. ​"I have not only observed the randomness of life, which often seems to be the consequence of arbitrary successes and failures, coincidences and mismatches, heartbreak and love, birth and death, but I also have seen the repeated patterns"
- Jônatas (artist and author). In Thy Tent I Dwell, first featured in 2016 at The Patricia and Phillip Frost Art Museum in Miami, is a masterpiece which retells the stories of immigration, adaptation, forced conversions, and hybridization of the artist's family through their 500-year Diaspora. Foregoing a linear narrative, Chimen has produced a multi-sensory experience of nostalgia by painting, threading, writing, and appliqueing on photographs, birth certificates, inquisitional archives, and immigration documents, in a large-scale museum-quality installation. Through the metaphor of the tent, Jonatas speaks of the universal immigrant experience of wandering through time and space, as well as of the isolation and secret religious practices which his family was forced to adopt as far back as the Spanish Inquisition in the fifteenth century.